Shack Shine provides exterior house cleaning in Mississauga that can transform the way you manage home maintenance. In one detailed visit, our friendly, uniformed technicians will arrive in a shiny, organized truck to cleanse the exterior of your home. You don’t even need to be home for us to get the job done for you. We offer an easy online booking system and world-class sales center to ensure you get the type of services you need. Most importantly, we’re confident we’ll provide you with an incredible level of clean. Our house detailing in Mississauga leaves your home positively shiny every time. We’ll even provide before and after pictures to show you just how shiny we make your home. No one wants to cleanse the grime and debris from the eavestrough system, but it’s essential to ensure water can flow properly away from your home’s foundation. At Shack Shine, our technicians use a high-powered vacuum and large canister to effectively cleanse away this debris so there’s no risk in backups impacting your home’s foundation or roof. No Mississauga house detailing would be complete without tackling the windows. Yet, we know those hard-to-reach windows never really get cleaned well. Our goal is to ensure this happens. We use the latest technology to create a streak-free shine that’s impressively clean. Our skilled technicians ensure each one of your windows gets the attention necessary. We offer both interior and exterior window cleaning. And, we’ll even move and replace home furnishings to ensure the best level of clean. House washing is an important type of home maintenance. It helps wash away the debris and dirt that accumulates on your home throughout the seasons here in Mississauga. Our team will provide you with a way to create a like-new look by scrubbing away the grime. We aim to reduce deterioration without damaging the exterior. To do this, we use the latest technology including water-fed poles, hand scrubbing, and rinsing systems. Shining home, smiling family – it’s what we believe. We know you want to take care of your home from top to bottom. 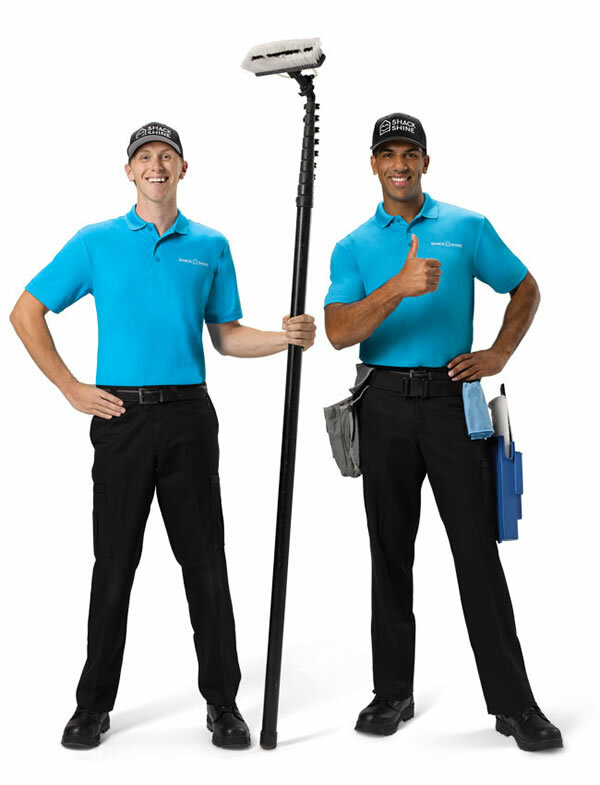 Our roof cleaning service in Mississauga aims to do just that. We use a low-pressure system to cleanse the mildew, moss, and other built-up debris from your roof. This helps to minimize wear and tear and can help ensure your roof lasts longer. It also helps to protect your home and creates a like-new feel. Making your home smile means starting at the top. Shack Shine utilizes power washing for many of the tasks we provide. Power washing is a safe and effective way of cleansing most horizontal surfaces outside of your home. As a key component of our Mississauga exterior house cleaning service, we will wash away unwanted grime and dirt from surfaces such as your home’s concrete or patio. By doing this, we help prevent early deterioration and can help your home to have an impressive look. Pressure washing is an alternative system we offer. The good news is that pressure washing allows us to cleanse surfaces – from the brick exterior to your decking – without the use of harsh chemicals. As a result, we’re doing our part to protect the environment and so are you. Be ready to have the brightest home on the block this holiday season. Shack Shine Mississauga location offers a Christmas light installation service, making it easier for you to get ready for the holidays. We offer high-quality commercial grade Christmas lights that are energy efficient for your home. Everything is 100% customizable from the style to how it fits your roofline. To make it even more convenient for you, we’ll return to fix burnt out lights and do the takedown at the end of the season. Let us help you get into the holiday spirit and do the hard work for you, so you can sit back and enjoy once it is finished! I grew up in Burlington and attended Wilfrid Laurier University where I graduated with a BBA. Despite choosing to study business in university, I never really saw myself as an entrepreneur until I got involved in College Pro Window Cleaning. It completely changed my perspective as I grew to learn much more about my strengths and weaknesses doing something real. 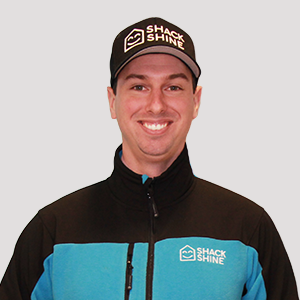 I heard about Shack Shine through Taleb Oubayan, Franchise partner of Shack Shine Hamilton. He had already been looking into the opportunity and felt a partnership might be an even better fit. It sounded like an excellent opportunity to capitalize on the skills I had worked so hard to develop in previous experiences. I love the brand and really believe it’s going to be something enormous in the relatively near future. I am very excited to be back in the driver’s seat doing what I love after spending the better part of the last decade in corporate roles. Here’s to the challenge!